Sorry the pic of Tim's eye is a little warped. I had to take a photo of my telly! So I was watching Tim Minchin on tv the other night, and besides nearly collapsing with laughter, I noticed how much he suited make up! Theres nothing wrong with guys wearing make up, but I do think they have to suit it so they can pull it off. 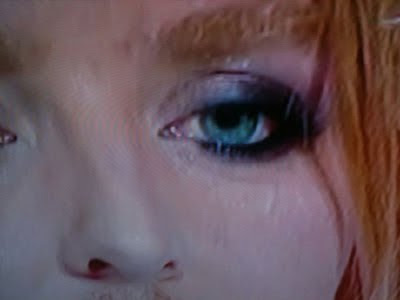 If theres one guy that can pull off dark eye make up, its Tim Minchin! I actually love him!